Let us tell you a little story about a handshake partnership and the beginning of Alabama's largest gourmet handmade candy company. Fort Deposit, Alabama, is located 35 miles south of Montgomery. The little town of 1,200 sprouted during the Revolutionary War around a military ammunition depository. And around the little town sprouted pecan trees. Lots of them. By 1935 there was a healthy trade passing through, with automobiles buzzing back and forth on the main highway between Mobile and Montgomery. Mr. Lee C. Priester owned and operated a Texaco station that serviced these travelers. But his customers wanted more than gasoline. Mr. Priester, or L.C. as he was always called, decided to offer refreshments and a little taste of the South. L.C. hired a local man named Caesar to help him gather pecans. Caesar knocked the ripened nuts down from the trees with a long stick and gathered them in sacks to bring to the porch of L.C. 's home. There the pecans in shells were bagged for sale next door at the service station. No one is exactly sure when "Special Order Number One" was placed, but a salesman who stopped to buy gasoline asked L.C. for a special favor. He wanted the pecans cracked and shelled to be picked up on his return from a business trip. L.C., being a good businessman, promised it would be done. L.C. arranged for local ladies to work for him on a contract basis, cracking and shelling pecans. Priester Pecan Company started with that first customer's request! The pecan business grew with help from Mrs. Priester and the local ladies. Soon the back porch could no longer handle the volume and a larger facility was purchased. With increasing sales, L.C. realized the need for a financial partner. He approached his long-time friend and business associate, Hense Reynolds Ellis. Hense owned the oil distributorship that supplied L.C. 's service station and a saw mill. He had served as both Mayor of Fort Deposit and as a board member at the local bank. And yes, he would be delighted to join his friend L.C. With a simple handshake and an initial loan of $200, Hense became the silent partner in Priester Pecan Company. Hense and his wife, Ellen Hagood Ellis, eventually brought their two sons, Ned and John, along with their wives May and Rose, into the business. Hense continued his involvement in the business until his death in 1965. L.C. also stayed active in making Priester's a success until illness forced his retirement. The Ellis Clan brought a critical increase in manpower, especially during the Christmas season rush. Later Ned Ellis took over the management of Priester's. While his brother John left to become a banker and businessman, Ned eventually bought the entire company. Ned, like his father Hense, has been successfully involved in quite a number of businesses over the years. A graduate of Auburn University, Ned went on to become a distinguished military veteran, a bank organizer, civic and religious leader, cattle rancher, dairy farmer, and poultry producer on his 3,000 acre Circle E Farms. He has also served as a board member and office holder for various national beef and pecan organizations. May, Ned's wife, has contributed greatly to the growth of the pecan company, while at the same time fulfilling the duties of a school teacher, wife, and mother. She is currently co-owner with her daughter, Ellen, of The Pineapple Gift Shop, with retail stores in two cities. Ned and May's four children, Thomas, Marsha, Katie, and Ellen, have all played a part in the American Dream of building a family-owned business. Today's Priester Pecan Company is managed by Thomas Ellis and Ellen Ellis Burkett. They both had began "helping" at the company by age 10. Now it seems that Tyler, Stinson, and Taber Ellis, along with Sally and Cliff Burkett will continue the American Dream family business tradition of producing the very finest quality pecan products for your complete satisfaction. 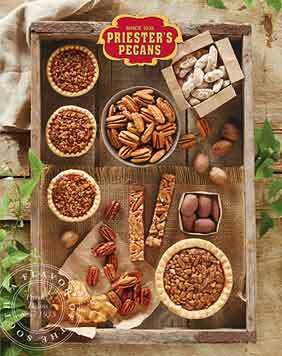 Priester Pecan Company has a long history of providing the finest nuts, desserts, pecan pies, gourmet gifts and gift baskets. Since 1935, we have shelled and packaged only the freshest and finest pecans in the South. It is our pledge to you that we will only ship the newest, freshest crop of pecans available to you and your gift recipients At Priester’s Pecans, we want you to be satisfied with every purchase. If any item does not completely delight you, we will be glad to honor our 100% Satisfaction Guarantee. Each package gives details for carrying out this guarantee.